You might have noticed that your browser shows a little favorite icon when you visit some web sites, but not for others. If you have a web site, you might wonder how to change that–especially if you use a host like Bluehost or Hostmonster, which add their own (sort of ugly) icons to your site. The icon is traditionally a 16px by 16px .ico file, which is supported by the most browsers. However, browsers are slowly ramping up support for other file formats. For getting started with favicons, stick with a 16px by 16px .ico. There are two easy ways for you to get started: Either create a 16×16 gif in your editor of choice and import it into favicon.cc, or draw it yourself pixel-by-pixel at favicon.cc. (optional) Create your image in your favorite image editor and export as a gift. Visit favicon.cc and import it using the “Import Image” button. 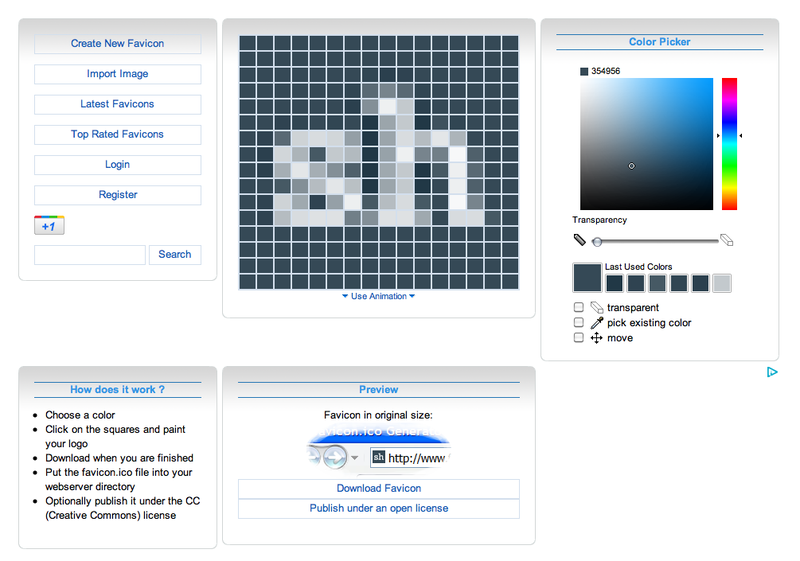 Open favicon.cc and draw or tweak your favicon. You’re currently seeing a blown-up representation of the image, but you can also see a preview in the Preview pane below. When you’re ready, click the “Download Favicon” button in the preview pane. You’ll get a custom favicon.ico downloaded to your computer. Upload that file to the root of your web site. So, for example, I uploaded mine so it was http://www.staffhacker.com/favicon.ico . That’s it! It might take a while for your browsers to recognize it’s there, but you’re ready to go. Nice. I actually just realized a week ago that I wanted this for my area website.